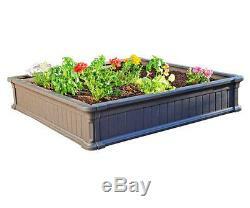 Lifetime 4 ft Raised Garden Bed 3 Pack [3 Beds, No Vinyl Enclosures] (model 60069). 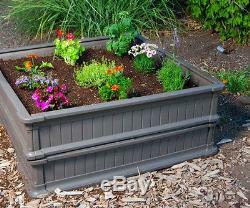 Constructed of polyethylene plastic with rust-resistant zinc-coated screws, the Lifetime raised garden bed will not rot or attract insects like raised garden beds made out of timber. This kit contains three 4x4 garden boxes. Four interlocking panels create the sidewalls. A weed barrier (not included) creates the bottom of the garden box to prevent weeds and underground pests from invading your garden. With a raised bed like this you can customize the soil to meet the needs of your plants and won't be at the mercy of the natural soil conditions in your area. The soil in traditional gardens becomes compacted from being walked upon and this compaction slows drainage and necessitates rototilling. But it is not necessary to step foot in a raised garden bed. Plant placement is done in a style called square foot gardening. Square foot gardening allows you to grow five times as many plants because it uses 20% of the space of traditional row gardens. You'll also appreciate that the interlocking panels allow you the option of relocating your garden box if necessary. These plastic garden bed panels contain no BPA. The Lifetime Raised Garden Bed Kit includes an informative Raised Bed Gardening Guide with helpful advice, tips, and tricks on plant spacing and watering techniques. Note:You will need a Weed Barrier to cover the bottom of your Garden Bed, and 16 cubic ft of Soil Mix. Soil Mix should be three equal parts of vermiculite to retain moisture, peat moss to make the soil light and loose for drainage and proper water retention, and compost to provide the nutrients your plants need to thrive. Assembled in the USA with US and imported parts. For more information about assembly, read the Owner's Manual Sample. Specifications Model Number: 60069 Quantity: 3 beds Style: Interlocking assembly Color: Brown simulated wood Material of Construction: UV-protected high-density polyethylene (HDPE) plastic Exterior Dimensions: 48.75 in. (1.24 m) x 48.75 in. (1.24 m), 9 in. (22.8 cm) height, panels can be stacked for 18 in. (45.7 cm) height Interior Dimensions: 44.5 in. (1.13 m) x 44.5 in. (1.13 m), 9 in. (22.8 cm) height, or stacked for 18 in. Then we will have new items sent to replace damages found right away. If other damages are found during assembly we will send replacement parts free of charge for 30 days after order date! 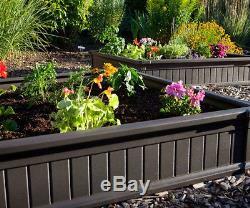 The item "Lifetime 4' Raised Garden Bed 3 Pack 3 Beds, No Vinyl Enclosures (model 60069)" is in sale since Wednesday, November 27, 2013. This item is in the category "Home & Garden\Yard, Garden & Outdoor Living\Gardening Supplies\Plant Care, Soil & Accessories\Baskets, Pots & Window Boxes". The seller is "shedsforlessdirect" and is located in Clearfield, Utah. This item can be shipped to United States.